By Hongkiat Lim in Desktop. Updated on December 14, 2017 . Mac OS X comes with the "Migration Assistant" that helps you migrate your previously customized settings and configurations from your Mac to your new one. It sounds like a good idea but if you want to avoid inheriting legacy files and some of the old problems that come with, you might want to start afresh. In fact, setting up a new mac just requires a few tweaks here and there. To make it easier for you, we’ve set up a checklist for the things you need to do when setting up your new Mac. If you are customizing a fresh copy of Mac OS X, then this post is for you. We’ve got in today’s article, or should we say checklist, some 15 things (plus a bonus mini checklist for designers and developers) you may need to do pre-installation and post-installation. We hope you will find it useful. Here are some of the information you need before initiating the installation process. 2. What to name this new Mac? We suggest using the naming convention of: [Firstname]’s [Device]. 3. Is your Internet connection working? If you’re not a fan of the trackpad, then this is the step when you get your mouse connected. If you work exclusively with the trackpad, you need to calibrate it. By default. when you scroll down, the trackpad page scrolls down. if during the test run, it doesn’t feel natural go to System Preferences > Trackpad > Scroll & Zoom and uncheck "Scroll direction: natural"
Do you want to share screen with another Mac? Are you working with peers or have a need to share your local files with them? 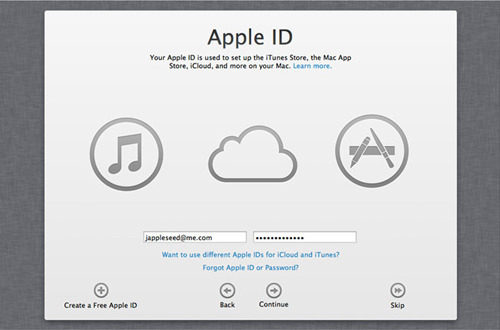 Do you need remote access to this Mac when you are away? Or is there a need to share other pheripheral devices (scanners, printers, etc) this mac is connected to with other people on a local network? If you answer ‘Yes’ to any of this, then you might need to visit System Preferences > Sharing to check/uncheck your preferences. Want to display your name on the menu bar like what you see in the image below? Select Show fast user switching menu as.. There are some productivity apps for example, TextExpander, which requires access to Mac’s assistive devices option. If you anticipiate using such apps, it’s advisable to turn them on. To do this, go to System Preferences> Universal Access > Check Enable access for assitive devices. To avoid accidental changes to the settings you’ve made, it’s good to lock the settings in system preferences. Upon locking, no further changes can be made unless you click to initiate an unlock option which requires a password. Dock is a convenient way to fire up apps you use on a regular or daily basis. However, default installation of the Mac provides you a set of suggested apps on your doc regardless of whether or not you actually will use them. If you don’t use them, this becomes a source of flutter. You can remove unwanted apps on your dock, by holding the icon and dragging them upwards to remove them. If for some reason you got a Mac with a lower spec which gives you less storage space, you might want to remove some of the default apps you are not going to use. To remove apps efficiently from Mac, we recommend appzapper. By default, your Mac keeps your desktop clean. That means that the icons or shortcuts to hard disks, devices or networks you are connected to as well as the discs you’ve mounted are hidden or invisible. Check the required items under Show these items on the desktop under the General tab. Whether you want smaller icons on your desktop so you can fit more, or bigger icons so they are more noticable, either approach are customizable via desktop configuration menu. Just right click on on the desktop, then choose Show View Option. You can experiment with ‘Icon size’, ‘Grid spacing’ and ‘Text size’ to customize them to your preference. Select ‘Snap to grid’ to allow your icons and folders to fall nicely into the grid you set with less effort. Java run time may be required by a couple of applications you’ll be installing later, the Adobe Suite of apps in particular. Click here to install it. If you are not a fan of Safari, it’s probably time to download an alternative browser. Will all of this set up, you’ll be heading over to the App Store, browse through your Purchased tab to re-download and install applications you’ve previosuly purchased. Spice up your desktop with some wallpapers. Check out our collection of Wallpapers. Get some free apps for your Mac. Check out our collection of apps here and here. Did we miss anything essential? Let us know with a comment. Now go have fun with your new Mac! . Click here for more Mac tips.